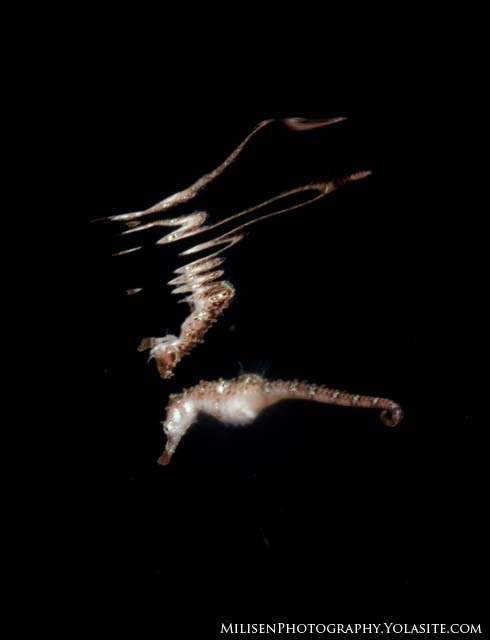 Kona's blackwater divers see pelagic seahorses (Hippocampus fisheri) infrequently at best. 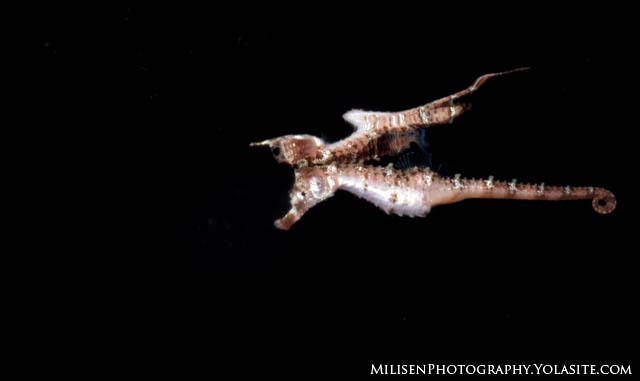 The first ones Kaimana Divers saw were during the first night dive I had to miss. When I saw the pictures of seahorses posted on Facebook, I was devastated to have missed the opportunity. In a previous life, I worked for the Waikiki Aquarium where my boss had tried to keep pelagic seahorses but gave up after they continuously got bubbles accumulating under their skin. The theory was that some aspect of the animals' physiology required the pressure of the depths to shrink the bubbles, allowing them to pass out through the gills without issue. I didn't have to wait long before I got my own seahorses to play with. The very next dive I was investigating the epipelagic animals when I saw some kind of fish swimming around just under the surface. Being a seahorse, it wasn't terribly fast, so I lined up, shot, and missed. Damn. 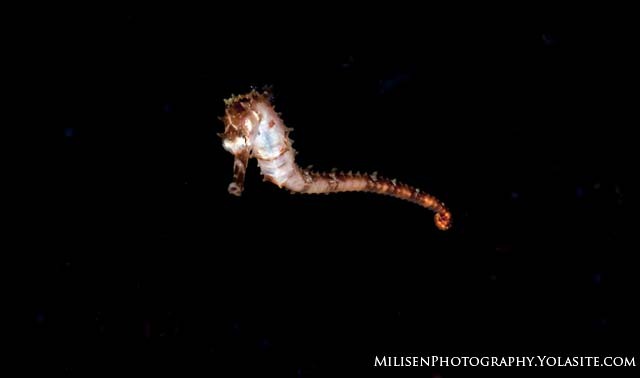 I fired off about five more out of focus shots before the seahorse left the surface to descend away. Blackwater dives are plagued with focus issues anyway, but for whatever reason, the camera was having extra problems focusing on the water-air interface. Fortunately, after the first seahorse showed up, many more followed, giving me lots of opportunity to stop down my aperture and line up to get the reflection shot I was after.